An adapter for converting a 3.5mm mini-jack cable to a TOSLink plug. This adapter converts a standard Minijack optical plug into a standard TOSLink plug. Ideal for making use of an existing lead where you need a TOSLink plug but have a Minijack connector on the end of your lead." 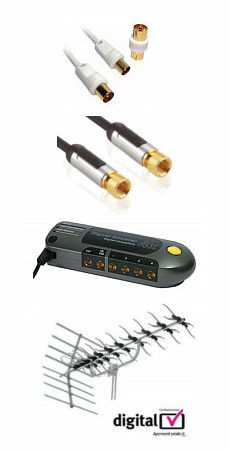 3m XLR plug to 1/4 Inch Jack Plug Cable, stereo (TRS) balanced audio cable. 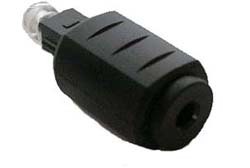 3 pin XLR plug to 1/4 inch (6.35mm) jack. For stereo TRS Tip Ring Shield applications. Ideal for microphone connections. Features flexible, fully screened cable with pure copper conductors. Length 3 meters. Ipod headphone splitter, connect 2 sets of earphones to your ipod / mp3 player. Ipod headphone splitter, 3.5mm jack plug to 2 x 3.5mm sockets. Allows 2 sets of headphones or earphones to be connected to your Ipod or MP3 player. Nickel plated connectors. S-Video / SVHS high quality video cable, fully shielded high definition oxygen free copper cable, attractive silver finish connectors with gold plated contacts S-Video cables are commonly used for video interconnect between home cinema components or PC video cards to TVs etc. An S-Video cable carries the video signal in two parts, Luminance (brightness) and Chrominance (colour). This provides far superior picture definition than composite video cables. 2m 3.5mm Jack Cable Straight to Angled Straight to 90 degree right angle 3.5mm connector both ends Stereo audio jack plug to stereo jack plug. Gold plated connectors. Colour black Length 2 metres Ideal for connecting audio devices to aux in connections Suitable for use with phones, tablets, laptops, PCs, ipods, portable audio devices and any other device with a 3.5mm audio output.